Ever since Ford Motor Company introduced the first EcoBoost V6 in the Ford Flex and then the Ford Taurus SHO, the company has been working to promote this motor as efficient yet powerful. When the EcoBoost F150 was introduced, Ford went a different direction with the EcoBoost marketing as they used the same 3.5L F150-tuned EcoBoost V6 to perform a variety of difficult tasks to show the power and the incredible durability. This newest project for the EcoBoost, where it will power a Daytona Prototype race car in the Rolex 24 at Daytona International Speedway shifts consumer attention completely to the performance aspect of things, coupled with an even more incredible measure of durability that will be required of the EcoBoost to handle a grueling 24 hour race. What is most impressive about the EcoBoost V6’s newest project is that the engine powering the new Michael Shank Racing (MSR) Daytona Prototype race car uses the exact same engine block and cylinder heads as the engine found in the Ford Taurus SHO. When Ford Racing began this EcoBoost endurance race project, they did so with the SHO EcoBoost and adapted it from there to make the kind of power needed to compete under the bonnet of a race car. As you can see in the video below which shows the EcoBoost on the dyno, the engine is designed to sit longitudinally so unlike the short exhaust manifolds that meet the turbochargers in the SHO of the F150 – this engine features huge racing headers that provide the thrust for the turbos. Back in the day, Ford had a goal of racing on Sunday, selling on Monday – meaning that consumers could walk into a dealership and buy the cars that were being raced on Sunday via the NASCAR racing series. That theory has been adapted quite a bit for with Ford Racing using a production engine block and cylinder head setup, prospective Ford buyers can see that the technology in Ford’s street vehicles is so advanced and so tough that it can stand the punishment of a variety of high performance racing scenarios. In the long run, I don’t imagine that many people are going to run out to buy a new Taurus SHO because they hear that the MSR Daytona Prototype is using the same engine but amidst the endless discussion about the durability of modern engine technology – this move to use the EcoBoost V6 in an endurance race car continues to show just how sturdy this compact, twin turbo V6 really is and that works to add buyer confidence to these premium engine options. 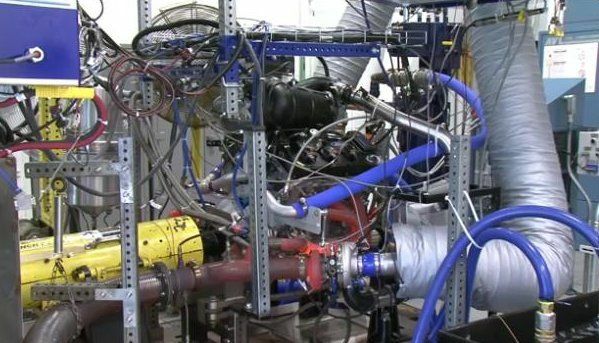 Unfortunately, this video doesn’t offer any power figures for the EcoBoost V6 but we do get to see – and hear – this monster V6 in action on the dyno. Not surprisingly, the 3.5L EcoBoost almost sounds like a throaty V8 as it is held at high RPM for long periods of time. Also, this video offers us a good look at the “hot side” of the turbo system which is clearly differentiated from the rest of the engine by the bright orange glow.